Lakeview Yoga is located in Peters Township, in the South Hills of Pittsburgh. We teach a variety of yoga classes with an emphasis on physical alignment and mindful movement. Our classes are thoughtful and reflexive to promote both physical and mental well-being. Kate took her first yoga class in a 1998 in a church basement while attending college in Ohio. Hooked, she immediately bought a mat and every book she could find about yoga. Over the next few years Kate continued to attend yoga classes at different studios and was often the only “flexibility challenged” student in a room full of dancers or naturally flexible people. It was this experience that gave Kate her first and most lasting lesson in yoga - quieting her natural competitiveness and practicing within her own body. This lesson inspired her to become a teacher and continues to inform her teaching today. Kate is an E-RYT 200 through Yoga Alliance. Her classes are creative and intelligent, supported by over 15 years of yoga and anatomical study. Kate is also a certified Relax and Renew© Trainer, studying under Judith Hanson Lasater. Her teaching is influenced by the many teachers she has studied with over the years including Christy Nones-Mackenzie, Desiree Rumbaugh, Richard Freeman, Rodney Yee, Doug Keller, Natasha Rizopolous, and Chrissy Carter. Kate is the owner and founder of Lakeview Yoga. Opened in 2012, Lakeview is a community yoga studio offering a variety of classes and private sessions to a diverse group of students. Valerie was first introduced to yoga in 2001 when she took a class while attending college in Colorado. In 2004, she sought refuge in yoga to help with stress and anxiety related to her career. Since then she has been hooked and has never looked back. In 2008, Valerie completed her 200-hour teacher certification at Yoga H'om in Robinson, Pennsylvania. Since then she has studied with Tiffany Cruikshank, Taylor Harkness, Janet Stone, Joe Barnett, Gina Caputo, Rodney Yee, Chrissy Carter, among others. She teaches vigorous, challenging, but always fun, flow classes; however, Valerie’s passion is Yin Yoga, a practice that opens the body’s deep connective tissues and joints through relaxation and meditation. She loves introducing her students to the world that opens up to them, both physically and emotionally, when they are able to find stillness. In addition to the asana, expect some rockin’ playlists in her yang (flow) classes and guided meditations in her yin classes. In her spare time, she enjoys watching live music, learning and reading about Hindu and Buddhist philosophy, going to the movies, and spending time at home with her boyfriend, her cat, Justice, and her dog, Hank. Denise attended her first yoga class in 2002. After steady and continued practice, she noticed not only increased physical strength but also an unexplained happiness and peace. Yoga was her answer to balance and self-acceptance. With a background in nursing, Denise is drawn to the healing aspect of yoga. She strives to help others find in themselves the peace, contentment, and strength that she gains from her own practice. She strongly believes that yoga can benefit everyone and that everyone can practice yoga, regardless of age, body type, personality or physical restrictions. In 2012 Denise completed her 200 hour teacher training with Donna Dyer at Yoga H'Om in Pittsburgh. When not practicing yoga, Denise works as a registered nurse in research and enjoys reading, crafting, being outdoors, and spending time with her husband and two daughters. Jamie Thornton has been practicing yoga for almost 20 years. She began her serious study of yoga in Boston with Helene Gurtner, Linda Chappell, and Kim Welby. While still an English teacher in Boston, she completed her first yoga teacher training with Judith Baker at FRA in Boston. She has also studied with Shiva Rea, Bo Forbes and Cyndi Lee. After moving to Pittsburgh, Jamie completed the 2010 Intensive Teacher Training with 3rd Street Yoga and Schoolhouse Yoga in Pittsburgh with Joanne Vandenhengel. She currently teaches yoga at W.R. Cameron Wellness Center in Washington. A life-long teacher, Jamie continues to relish the satisfaction one gets from teaching. Off the mat, the most valuable thing she has learned in her study is that yoga coaxes us to learn and marvel at the way the body and mind are so intricately and wondrously connected. This recognition brings her glimpses of wisdom, and even bits of wisdom is reason enough to practice yoga forever. Britney Kwiatek, RYT specializes in beginners, flow and restorative styles of yoga. She completed the 200 hour YogaWorks certification in 2013. Her study was done under the mentorship of Anna Gilbert Zupon at Breathe Yoga Studio in Pittsburgh. It is Britney's mission in conjunction with the mission of YogaWorks to teach a signature style balancing precise instruction, alignment with breath, fluid movement, and thoughtful sequencing. When she is not practicing yoga or spending time with her husband and two boys, Jude and Julian, you can find her running, cross training, participating in Mud Runs and 5Ks. Rooted in Pittsburgh, Britney looks to share her passion of Yoga to the community. Monica knew as a little girl she wanted to serve others and help make positive changes in the lives of others. In 2007, she began her yoga practice and found the benefits to help heal and empower through this mind-body-breath connection. In 2013 she completed her 200 hour teacher training journey with Donna Dyer and Maggie Borza-Petrie at Yoga H'om. Monica believes the magic of yoga is equal parts effort and effortlessness, holding on and letting go, and feeling peaceful yet powerful. Monica’s classes are light-hearted and fun while building heat through a creative vinyasa sequence. Expect to play, explore, heal, and grow through awareness, acceptance, and grace. Come as you are into this judgement free zone, and expect to take what you learn on your mat - off your mat - and into the rest of your day. Vicky found yoga in 2000 after purchasing a yoga tape to support her running and weight training regimen. Instantly she realized yoga offered far more than a mere physical workout; it was a lifestyle. Over the years Vicky maintained her practice and in 2011 completed the 100 Hour Yoga Lifestyle Program at Three Rivers Yoga. For a few years yoga took a back seat while Vicky obtained her license in massage therapy. In 2014, she reconnected with herself on the yoga mat and completed the 200 Hour Yoga Teacher Training program at Yoga H'om and Yin Teacher Training at Stray Dog. She is currently enrolled in advanced studies at Kripalu Center for Yoga and Health. Vicky's yogic influences include Tracey Rich & Ganga White (White Lotus), Suzanne Deason, and Rodney Yee. When not providing massage or playing in the studio, Vicky is most likely on a hike, at the beach, or learning something new. Sarah studied with Lisa Clark for her 200 & 300 Hour EmbodiedYoga Teacher Trainings, and is registered as a 500RYT with the Yoga Alliance. Sarah began her yoga journey in 2013 after her husband returned from Afghanistan, and she began looking for a deeper understanding of the mind-body connection. She never realized yoga would turn into a passion as her practice has served her time & time again to return to home-base, her body and breath. 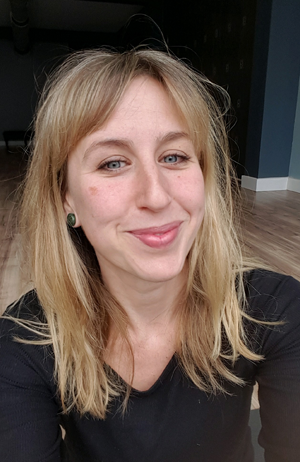 Sarah's teaching style and personal practice involve deep inquiry, observation, mindfulness, and whole bodied expression within the form and practice of yoga. Sarah applies what she knows about developmental movement and experiential anatomy to help awaken, align, and integrate the whole body in her classes. Sarah always come to practice with an open-mind but hopes to guide her students to actively meet the earth & to reach for the stars. Originally from NY, Kathy moved to Pittsburgh about 9 years ago. Having a lot of drive has helped her to be successful in her career as an IT manager, however with that came stress. Through the years, Yoga has helped to melt away the stress and she found herself leaving each class feeling refreshed. The more she attended classes the more she yearned for something deeper out of her practice and decided she needed to share that with others, completing her Yoga teacher training in July 2018 through SHPY. Off the mat Kathy is passionate about creating artistically; from photography to playing piano and anything in between. She loves live music, outdoor adventures, and cooking. Friends, family, husband would describe her as a unique goofball who enjoys meeting new people, new experiences, taking care of others, and can have fun doing anything. In 2005 Heather attended a retreat at Ananda Ashram in Monroe, NY. It was there that she first encountered her teacher, Sri Dharma Mittra. She attended his meditation, and knew this was her path. The following year, she attended his teacher training at the Dharma Yoga Center in New York City and received her certification through the Yoga Alliance. Heather’s goal in teaching yoga is to share with others the happiness and peace she has found. Yoga aids in calming the mind and body to feel the connection that exists between all living beings. Through asana, pranayama and meditation we are led to stillness. We receive all of these spiritual and mental benefits, while the physical body is becoming strong, flexible, and healthy. Susan’s yoga journey began in the early 90’s after watching a VHS tape. She loved how she felt after doing the practice and was immediately hooked! Having been in the sales field for the past 30 years and interacted with many people, she believes that all can benefit from yoga and finds much joy from sharing her practice with others. She is a registered RYT 200 instructor and is currently working towards her RYT 500 certification through the Himalayan Institute of Pittsburgh. Susan wants you to know that you can enjoy the fulfilling benefits of gentle movement and deep breathing regardless of your experience with yoga and your current physical condition. When not practicing yoga, Susan loves to hike, bike, travel and spend time with her family and friends, especially her 4 delightful grandsons. In less than a year, a coworker, relative and her best friend had been diagnosed with breast cancer. Just like thousands of others, this had Lisa thinking, “What is going on and what can I do to help?” Lisa’s best friend Linda shared so much regarding her emotional and physical wellbeing. But there was one thing she did express that struck a chord…. It was how physically exhausted she was but how she knew she just had to keep moving. This led Lisa to start researching on how yoga could help with cancer patients. It wasn’t just what she found, but who she found, Tari Prinster, Founder of y4c, Master Yoga Teacher and Cancer Survivor. The 45 Hour Yoga Certification she took at Kripalu Center for Yoga & Health was an eye opener. Yoga4Cancer – y4c is a specialized yoga methodology that is tailored to address the specific physical and emotional needs left by the cancer and its treatments. This unique approach is not just gentle or restorative yoga but focuses on how to stimulate the immune system through movement, improve flexibility and strength along with reduced anxiety and boost overall wellbeing. Lisa is y4c Certified and 200 Hour RYT. She volunteers her time teaching the employees and their children at Aquatech International where she is employed full time along with yoga classes for the Cancer Caring Support Group in Wexford. It is Lisa’s hope that through yoga anyone with cancer can regain strength, not only physically but emotionally to continue their journey to recovery. Allie loves to share this practice with students of all ages. Since completing her training through 3rd Street Yoga at Schoolhouse Yoga in 2011, she has taught for the YMCA, Schoolhouse Yoga, Chatham University, Children's Hospital of Pittsburgh, and private lessons for students recovering from illness and injury in NYC and Pittsburgh. Her sequencing is fun and flowing, with a special focus on helping students safely grow in strength and mobility. Off the mat, Allie works as a voice actor, assistant director, and stage manager. Proud member of Actors' Equity Association and the American Guild of Musical Artists. In 2012 after experiencing some traumatic personal events, I decided to change my life. I left my 60 hour a week job and unhealthy lifestyle and dedicated myself to wellness and healing. That year after receiving so many benefits from a regular yoga practice- I set the goal to teach. In 2017 I reached that goal and earned my 200 hour training through Jenn Ferris-Glick at Illume (formerly Exhale) Pittsburgh. My classes are generally based on a theme (i.e. heart opening, cultivating sattva, etc...) gentle, mindful, and restorative. My goal is that you leave class feeling centered, opened, and connected. I am also a wife and mom, a Reiki Master, and a deep lover of Nature and Ayurveda. My hobbies include reading, cooking, hiking/wandering, cold plunging, hot sauna-ing, and exploring. I hold my amazing unfolding life with profound reverence and gratitude. Blessings.